Go Sailor is a bit of an odd choice for our classic albums section, being as it isn’t really an album at all. Released by Lookout! Records in 1996 it is actually a collection of the three EPs the band recorded plus a couple of compilation tracks. However, given that it amounts tom pretty much the bands entire, very short, recording career and sounds so perfect as a single disc I’m going to make an exception. 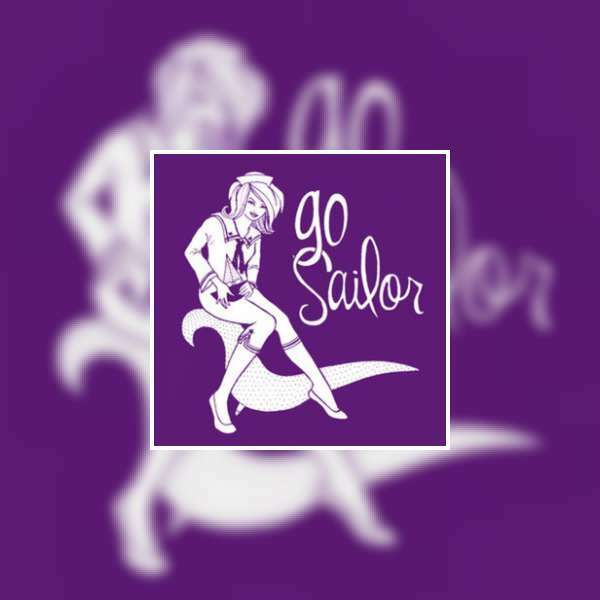 Go Sailor was a bit of a side project for singer and guitarist Rose Melberg who was also playing with Tiger Trap and The Softies during the band’s two year existence. Joined on bass by Paul Curran (later of Crimpshrine) and drums by Amy Linton (later of the Aisler Set) they played a high energy melodic version of what would become known as “twee pop” (not a term that I am entirely comfortable with due to some of the more negative connotations). It is a collection of pure guitar pop, every song sounding like it could have been a single a-side. The band may have been based in Berkeley California but the sound would have fitted right in with the British c86 movement. The fast jangle guitars and bittersweet lyrics bringing to mind a female Californian David Gedge at times. Most of the songs are love songs, sung with one of the sweetest voices in indie-pop, but the lyrics show more off a darker edge to Melberg’s songwriting. When she sings “I don’t think of hurting you much anymore” in ‘Fine Day For Sailing’ it sounds just a little bit sinister and threatening. It is hard to pick any standout tracks from an album which is so consistently good but the impossibly bouncy ‘Long Distance’ is a firm personal favorite. This is Melberg’s album, her personality driving the songs, but the lively drumming and melodic bass are key ingredients in infectious sound throughout the album. Bassist Curran even gets his moment in the spotlight with the sparkling punky ‘The Boy Who Sailed Around The World’, and you can watch a video of that song from their show at Indietracks here. The band reformed a few years back to play some shows and recently played a string of shows in the UK for the first time. If you ever get the opportunity to see them play grab it with both hands, you are in for a fun set. The album is hard to get hold of in physical form, but you can pick it up in MP3 form on Amazon for a bargain £7.49. Also recommended is anything by any of Rose Melberg’s other bands as well as her solo recordings, the most recent of which was released by WIAIWYA in 2009. I didn’t realise until Free Swim got in touch with us this week that we were the first ever blog to review them, way back in 2010. Since their first EP, Two Hands is Ok, landed on our doormat in November that year, they’ve been building up a solid reputation as one of the UK’s most interesting and fun indie acts and favourable reviews by many others have followed. The subject matter for their first three concept EPs, concerning hand grafting, a mountaineering panda and a south London bromance, shows their sense of English whimsy. Live they go one step further, with their bassist dressing up as a giant panda. But underneath all this classic English eccentricity the band, which is in essence multi-instrumentalist Paul Coltofeanu, is actually very, very serious about music, sounding a little like Super Furry Animals mixed with Flaming Lips and Mercury Rev, but wholly unique. On EP number four She Dreams in Lights they’ve toned down the whimsy and decided its time to unleash Free Swim, the indie pop and rock act on the public. BBC Radio One has already bitten and Coltofeanu, who wrote all tracks and played all the instruments on the EP, turning up on Hew Stephens show recently to chat about the EP. It’s a savvy move, letting the public focus more on the music rather than the gimmicks and to showcase a five-song collection that stands up well against the band’s influences, most notably Super Furry Animals. 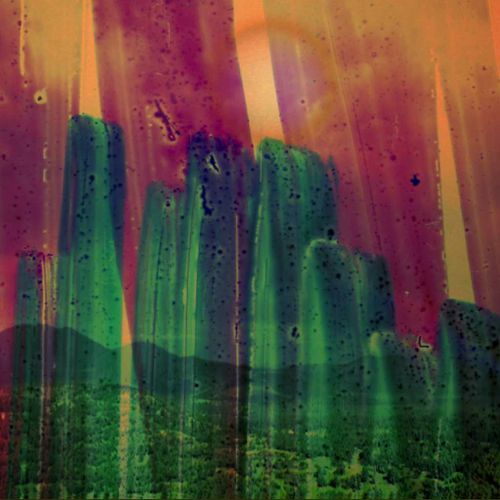 It’s third track Vuvuzela Venezuela with its sweeping build up, and opener Records in the Basement, where the protagonist falls asleep amid Mercury Rev style indie psychedelic pop riffs, that are the immediate standouts with their clever turns of phrase and twinkling guitars. Final track The Snooze Function, when the girl awakes, is the most psychedelic of this collection with more than a nod or two to The Flaming Lips. By turning down the whimsy and focusing more on the music they’ve lost none of their excitement or identity and there’s every chance this could be the breakthrough EP they deserve. After attending last year’s inaugural Godney Gathering, the one-day festival taking place in a farmer’s field near to Glastonbury, I had high hopes for this year’s event and a clear idea of what to expect. However, the south-west’s infamous summer rain had other ideas. Just a week before the event photos of the site began circulating. Rather than looking like a field capable of hosting hoards of music fans and bands the waterlogged site looked more like the venue for an Olympic rowing event. The event could so easily have been cancelled, but the organisers pulled out all the stops and with just days to go announced that a new venue had been found big enough to cater for thousands of festival goers – the nearby cattle market and conference venue The Venue @J24, North Petherton, Somerset. The Hoosiers were next up and despite not gracing the singles or album charts since 2010 their hits from the last five years such as Worried about Ray and Goodbye Mr A got a fine response from the cheering crowd. 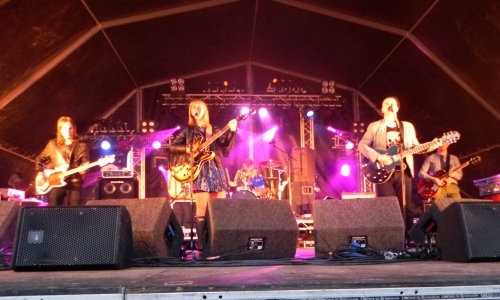 Among the most exciting festival acts of recent years is The Subways, who were famously booked to open The Glastonbury Festival’s Other Stage in 2004 after the indie-rock trio sent organiser Michael Eavis a demo. They’ve gone on to play Leeds and Reading and their debut 2005 album Young for Eternity has now gone gold. Having seen them a couple years ago play at nearby Bridgwater Palace, I was certain they would play a breath taking energetic set and was not disappointed. They entered with a mash up of music from Charlie and the Chocolate Factory and 2001: A Space Odyssey, which helped build up tension and garnered a huge roar from the crowd. 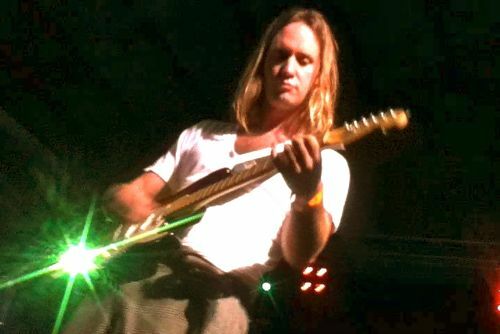 From the first song guitarist Billy Lunn was great at getting the crowd involved; seeing who could scream the loudest and making everyone sit down then go crazy. In this set I really saw the energy in the Godney Gathering and it was amazing. 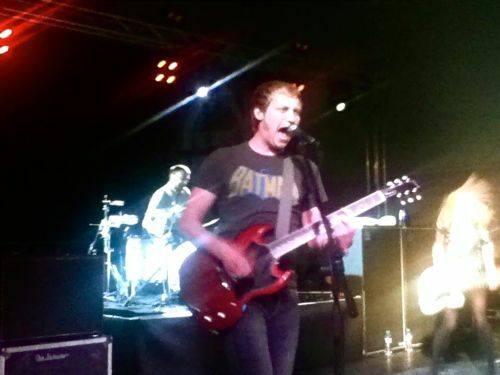 The Subways opened with their 2004 single Oh Yeah and the energy didn’t let up. This is definitely a band to see more than once. 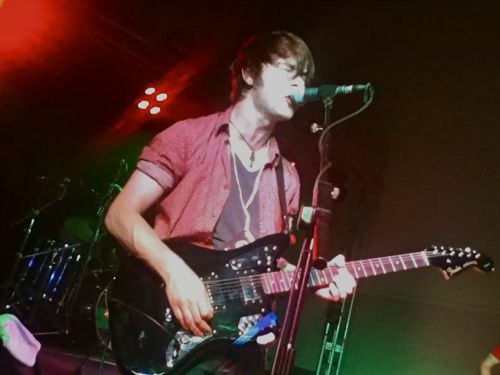 Young Aviators may not have the back catalogue of some the earlier acts but proved a worthy headliner with their fusion of new wave and surf music. It was an intense and surprising set and they clearly gave it all onstage. Despite the excellent line up there were a few areas of criticisms. The acoustics at the venue were not great, and while organisers had kept the price of drinks down (£2.50 for a pint of beer or cider) the same could not be said for the food, with festival goers asked to pay £2.50 for a small portion of chips. But considering the event nearly didn’t happen at all these are very minor gripes about what proved to be another successful Godney Gathering. Such small festivals are an important and cost effective way for people to enjoy music in their local area without forking out heavily on a weekend of camping at the likes of T in the Park or Reading. They deserve to be supported, especially when the organisers manage the seemingly impossible task of moving a festival venue with just a few days to go. We are certainly looking forward to next year’s, which hopefully for the organisers will coincide with some better weather. Honourable mentions: The National – Racing Like a Pro, Queens of the Stone Age – The Bronze, Guided By Voices – Keep It In Motion, LCD Sound System – Sound of Silver, The Decemberists – The Sporting Life, Beck – Loser. When lots of reviewers talk about Class Clown Spots A UFO, and the previous release Let’s Go Eat The Factory, they’ll tell you that it sounds like Alien Lanes. Alien Lanes is probably the quintessential album by the so-called “classic line-up” that reunited so successfully for these two albums (so far) but the alleged similarity with that album is misleading. The albums sound more like Alien Lanes than, say, Isolation Drill or Do the Collapse but these are very different sounding albums. What we have here is the sound of the mid-90s line-up as filtered through the mind of Robert Pollard today. The good news is that this has produced a sound that manages to be simultaneously classic and fresh. The album starts in typical fashion with the slightly ragged ‘He Rises! Our union Bellboy’ before slipping into Pollard’s favourite Who mode for the brief ‘Blue Battleships Bay’ – so far so good. Track three sees the first contribution from Tobin Sprout, ‘Forever Until It Breaks’, and marks the start of one of the strongest runs of songs on any Guided By Voices album. Five songs so brilliant, and so different, that they would be worth the price of the album alone. The aforementioned Sprout song manages to captivate for over three minutes with a backing that loops the same single guitar riff throughout. It is followed by the title track, one of those brilliant pieces of Pollard pop melody that you know he probably tossed off before breakfast one morning. ‘Chain To The Moon’ is less than a minute of echoed vocals and roughly recorded acoustic guitar. A demonstration, if one were needed, that this kind of demo quality track is an essential part of the Guided By Voices magic. ‘Hang Up And Try Again’ is a classic heavy riffed stomper that sounds like a lost Mag! Earwig song, albeit with slightly less refined guitars. Best of all is ‘Keep It In Motion’, a song that sounds nothing like any other Guided By Voices track, but one that fits in perfectly on this release. The next couple of tracks are less than perfect, an overblown psychedelic wig-out (‘Tyson’s High School’) and an uncharacteristic weak Sprout offering (‘They And Them’), but inconsistency and questionable editorial decisions are such an essential part of the Guided By Voices experience that this doesn’t really matter. Particularly when the rest of the album is so good and the overall quality is of a standard that shouldn’t be possible from an artist who is on his 15th album into a decade which is less than three years old (15 albums is an estimate -it is hard to keep count). 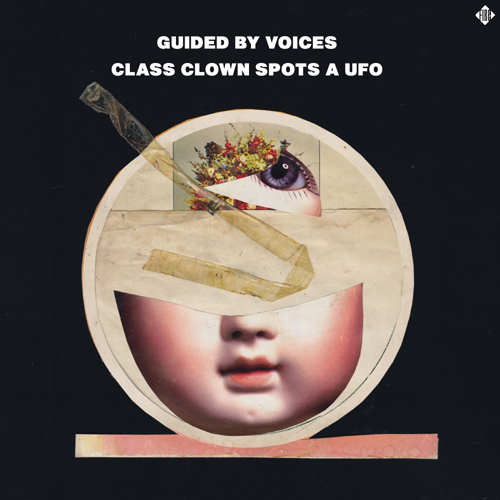 The variety on this album is typical of Guided By Voices, but even in those terms it is still an impressive achievement. The album has spawned three singles, the title track, ‘Keep It In Motion’ and ‘Jon The Croc’. I struggle to think of any artist that could release three such varied singles from one album, and for them all to be as good as they are is even more impressive. When Guided By Voices returned people seemed genuinely surprised how good their “reunion” album was. Class Clown Spots A UFO proves this wasn’t a fluke and, in fact, is just that little bit better that its predecessor. 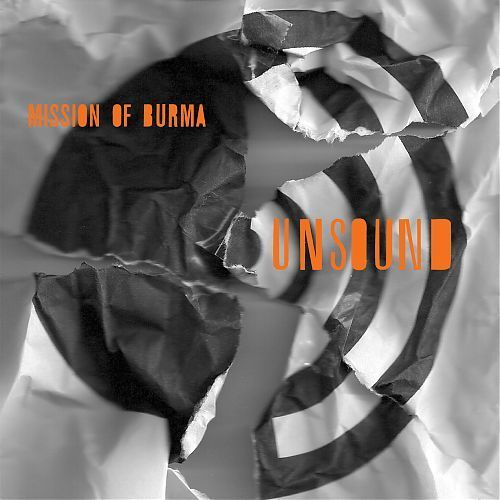 Mission of Burma – Unsound. Unlike so many classic American punk and indie rock acts Mission of Burma’s return in 2004 was not about churning out hits of yesteryear on an increasingly tiring indie rock heritage trail. They are perhaps unique among US punk pioneers; still trailblazing new songs, still raw and remarkably still sounding like a bunch of teenagers playing together for the first time. Their renaissance following a 21 year break, when guitarist Roger Miller’s tinnitus forced the band to split in 1983 after just four years together, has been so successful artistically that when people see them now their old and new tracks are called out for in equal measure. That was certainly the case when we caught their show at Pavement’s ATP Festival in 2010. Among the highlights from this renaissance has been 2006’s album Obliterati, with its Husker Du harmonies, killer bass melodies and even the oddest cover of Donna Summer’s I Feel Love you are ever likely to hear. While Unsound follows the same path as this excellent example of a veteran band reborn (except for the Donna Summer covers) it still feels different and cutting edge. Play Unsound to a bunch teenage indie kids and they may well picture it being played by skinny jean teenagers rather than a trio of middle aged Boston-ites. Take opening track Dust Devil, perfect three piece punk rock in action, bass carrying the melody, guitar and drums chopping around it and vocals with just the right level of distortion. One of the key aspects of Mission of Burma is their desire to push the guitar, bass, drums and vocals template to the limit. The harmonics and wah-wah on second track Semi-Pseudo-Sort-Of-Plan may on paper not sound earth shattering but in this trio’s hands it sounds fresh as a daisy. This is Hi-Fi is among is among the best on an album that has no duff tracks. Another highlight, Part the sea, has one of the best power chord openings of the year. As well as the band’s trademark wooshing loops and background noises, including some backwards loops in places, they also add trumpets to the mix on a handful of tracks such as Add in Unison, which sounds like an unlikely blend of Canadian rockers No Means No and a Northern brass band. It was the band’s regular fourth member Bob Weston (of Shellac) who took trumpet duties on Unsound, in addition to providing his more usual production and looping work for the band. On Unsound Mission of Burma continue to excite and challenge the punk and indie rock genres that they helped invent. This clip, recorded live on 7th July at Inditracks 2012, is of Go Sailor performing ‘The Boy Who Sailed Around The World’. It is an uncharacteristic song in that it is their only track where Rose Melberg and Paul Curran switch places, with the latter handling the guitar and lead vocals. Indietracks 2012 was my first experience of the “indiepop at a heritage railway” festival and, for reason that should become obvious, it is unlikely to be my last. Arriving at the campsite, independent from but close to the festival itself, I was a little concerned as the rain bucketed down upon us. The rain soon stopped and sun returned, a sign of things to come with sun primarily dominating the periodical heavy showers over the weekend. 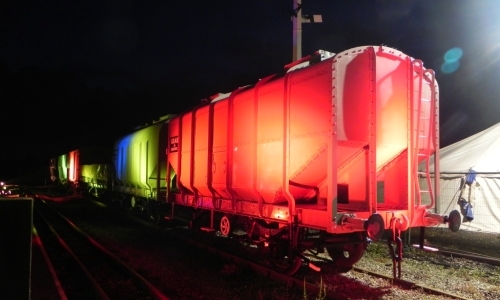 Arriving at the festival site itself, the charming Midland Railway Centre, we found that the bands had been driven inside by the inclement weather and would play on the second stage in the cavernous train shed. The first night of music was limited to just three acts, but it proved to be a pretty satisfying evening’s entertainment none the less. 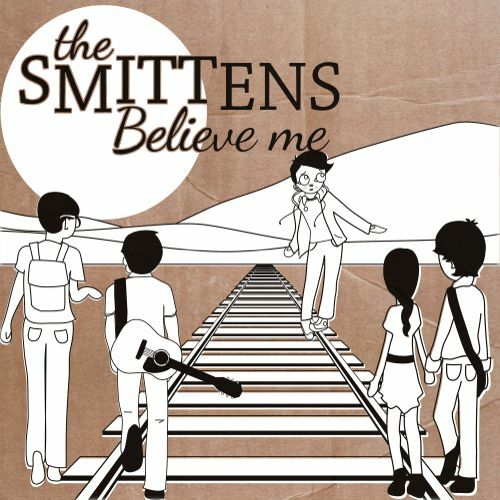 First up were The Smittens, a technicolor blast of cheerful pop from Vermont. Sitting somewhere between Architecture In Helsinki and The Magnetic Fields they put on a good show and open the festival in an appropriately quirky manner. Next up The School set a high bar for the most members in a band with their sweet vocals and soulful 60s pop sound. Belle and Sebastian are a clear influence, or at least the band are coming from a similar musical place. Finishing the night, and turning in one of the sets of the festival, saw Darren Hayman and the Long Parliament turn in a crowd pleasing mixture of new and old favourites. A new line-up sees Allo Darlin’s Bill Botting move to guitar, Tigercat’s Giles added on bass and the addition of a keyboard and harmonium player. This backing band could well be the best in his career and the songs, including a version of The Bee Gees ‘I Started A Joke’, sounded brilliant throughout. A closing version of Hefner favourite ‘Painting and Kissing’ goes down a storm and sees Hayman hammering his guitar during the extended outro. Day two saw the standard pattern begin in earnest as we flitted between the outdoor stage and the train shed to catch the best of the acts. First up outside was the pleasant, if a little generic, pop of The Birthday Kiss. They suffered, as most outdoor acts did, from a smaller crowd as people prepared for rain and headed inside to the guaranteed dry safety of the train shed. (One suggestion for the organisers would be a beer tent near the outdoor stage to encourage people to stay there even if the clouds threatened). First act inside was more interesting as Vacaciones brought an energetic punkiness to their sweet Spanish pop tunes. Flitting back outside we caught a little of the Evans the Death set, a band that impressed me a lot more live than they had done on record. The outdoor music was cut short as we decided to catch the next round trip on the steam train (free to all festival goers). This proved to be a relaxed and picturesque experienced and meant we got to catch one of the train carriage gigs happening throughout the weekend. Marc Elston‘s brand of acoustic songs may not be anything new but it sounded pretty good played to a toddler heavy audience in one of the moist unique festival venues. Back on stationary ground we headed to the front of the shed to see if Tigercats could live up to the high expectations their debut album had created. They didn’t disappoint turning in a really confident and energetic set which included the bulk of the album. The strong tunes and interesting arrangements supported by a great rhythm section including the best drumming performance of the weekend. Returning to the music (via the Burrito van – some of the best festival food I have ever eaten) we made our way to the stage to see one of my most anticipated acts of the festival, Go Sailor. Go sailor are one of those bands that most people will never hear, but are a firm favourite with those that know them. Lead by Rose Melberg (more on whom later) they play a pure high energy guitar pop that is the sound of happiness, despite the bittersweet lyrics. The crowd should be bigger but again the rain comes and people (those without umbrellas at least) are sheltered in the shed. Headliners Veronica Falls do a better job and it is nice to see a big crowd at the outdoor stage as the sun descends. They walk a neat line between upbeat and dour and it is a reminder to me to check out their album when I get home. Day three proves to be the most varied and eclectic mix of the weekend. It is apparent though that what a loty of acts have in common, be it the endearing noise of The Spook School or the pitch perfect vocals of The 10p Mixes, is a DIY ethos that reminds me of the first wave of punk. If you can’t guarantee money from music sales then you can generate a fan base by handing out handmade CDs to the crowd. The rest of the day is dominated by indie veterans who set a pretty high standard for the younger acts. Brighton C86 survivors 14 Iced Bears prove to be the latest victims of the rain adjusted crowd syndrome but their melodic psychedelia sounds pretty good to those that stick it out. Stevie Jackson also suffers from the opening clouds but does a better job of keeping hold of the crowd. He plays an engagingly eclectic set that moves from pop to blues to an appropriate cover of Dillard and Clark’s ‘Train Leaves here This Morning’. His song sounding much better freed from the shadow of Stuart Murdoch on the Belle and Sebastian records. Super stylish surf pop from Seattle residents Orca Team takes a little while to warm up the crowd in the train shed. By the end of the set it seems clear that this is one of the bands to watch from the festival and they might turn in to something that little bit special in time. 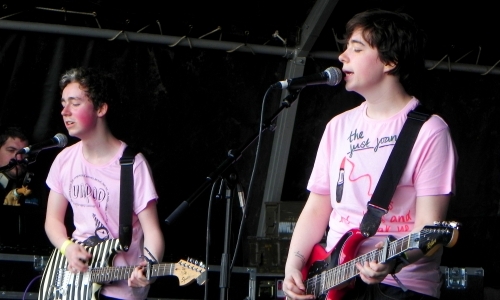 One band that seems fully formed, at the busiest outdoor daytime show of the festival, is Allo Darlin’. With two excellent albums to draw from they move from pop gem to pop gem for the partisan crowd. 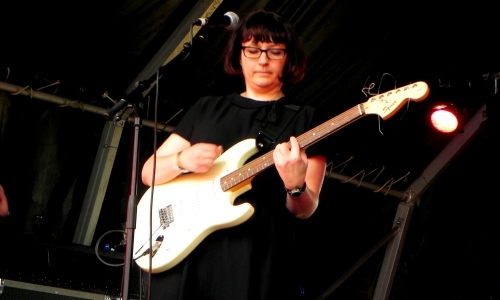 With a rock solid rhythm section (including the engagingly bouncy Bill Botting), a fantastic lead guitarist and a front-woman with real star quality they are the “band most likely to” on the bill. Sadly I have to cut their set short to make sure of space in the church to watch Rose Melberg play a solo set. It proves to be worth it though as she turns in the performance of the festival to the hushed and attentive crowd. Her voice is sweet and gentle and the songs sad and lyrical, perfect for the setting. She is also the second act of the day to cover Kirsty MacColl’s excellent ‘They Don’t Know’, which sounds pretty lovely both times. I head to the merchandise tent after the set to pick up one of her solo albums to find the WIAIWYA record boss still wiping tears away from her set, I doubt you see that with major label bosses (who are also unlikely to man the merchandise stall). Finishing the festival off in irreverent style is Kurt Cobain favourites The Vaselines, a band who recently returned after a 20 year hiatus. The banter between Eugene Kelly and the filthy mouthed Frances McKee (who offers herself up to the crowd and claims to have given Jesus a blow-job the previous night) is very entertaining, as is there messy alt-rock sound. Supported by some excellent guitar (supplied by Stevie Jackson) they rip through a bit proportion of their small back catalogue. They also prove Kurt Cobain right, ‘Son of a Gun’ is just a brilliant piece of music. There are a dozen reasons to recommend the festival to anyone but the most indie averse music fan. The interesting setting, the variety of stages, the friendly reception from the railway staff and volunteers and the cheap and plentiful beer on offer. It really is a unique musical event and I hope it continues on in the same vein for years to come. With so many festivals struggling it is important that a few truly independent festivals survive, we don’t end up with bore-fests like Isle of Wight as the only options. As we stand by the road waiting for our taxi back to the station a car pulls up, “I hope you enjoyed your weekend lads, come back and see us again next year” says the old boy behind the wheel. I bet you don’t get that when you leave V Festival. See more pictures from the festival in our Flickr gallery. 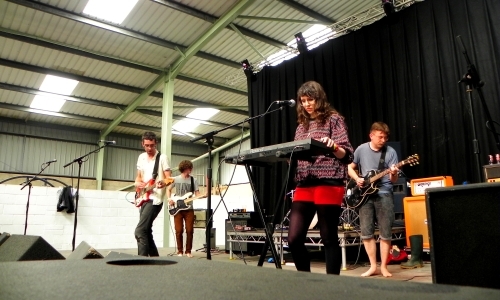 Read our review of the 2011 Indietracks festival. Fang Island, the missing link between Bill and Ted’s Wyld Stallyns and indie rock, are back, with a second album that is just as exciting, fun and mental as their self- titled 2010 debut. What I particularly like about this Rhode Island band is they don’t take themselves or the genres they mash up that seriously, but still manage to appear among the most professional and accomplished rock bands around. Take one of their first Youtube clip’s called Kindergarten, it features the band answering questions in a real life kindergarten and then playing their frenetic tune Chompers to a bunch of pogoing toddlers. It’s life affirming stuff. Thankfully Chompers features towards the end of this excellent second album, which contains similar frantic instrumentals as their debut album, all mixed up with blazing power chords and even more anthemic indie rock. The song that is most similar to their debut’s standout and rare vocal track Daisy is Major’s third track Seek it Out, a track designed for cool indie kids that secretly just want to air guitar and wave lighters in the air at stadium gigs. Asunder is another that is sure to bring out the Whitesnake fan in us all. The stomping Dooney Rock is a marvel of silliness, especially the change of pace about a third of a way in. After Dooney Rock and Chompers the album gradually comes to an end with Chime Out and Victorinian, which finishes the album as opening track Kindergarten started it, with an intricate and serious keyboard arrangement that masks the silliness within.